When BMW unveiled the M3 and M4 at the Detroit Auto Show back in January, we told you that the new sportsters were starting at $62,000 and $64,200, respectively. That leaked info, though, only told a small part of the story for the new M cars. 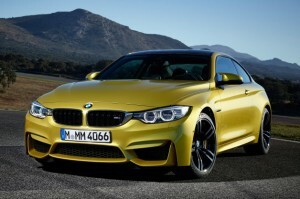 Now, we have the complete pricing sheet on the new coupe and sedan, direct from BMW. The pricing intel that we had at the time was correct – prices start at $62,000 for four doors and $64,200 for two. Those prices don’t include the $925 destination charge. Potential customers should also plan on spending an extra $550, as seven of the eight paint options are of the metallic variety. BMW’s trademark Alpine White is the only no-cost paint option. As for the cabin, customers will, interestingly, have the choice of a cloth/leather combination as standard. That’s in addition to the standard suite of leather options. There are also extended leather and full leather options, for $950 and $3,500, respectively. There are three option packages available, covering all the extra goodies for the M3 and M4. The $1,900 Driver Assistance Package adds blind-spot monitoring, Active Driving Assistant, a side- and top-view cameras and speed limit info. The Executive Package adds a heated steering wheel, comfort access, a rear-view camera, park distance control, a head-up display and satellite radio, with prices starting at $4,000 for the M4 and $4,300 for the M3 (which adds heated rear seats). Finally, a $1,900 Lighting Package adds automatic high beams and adaptive LED lights. For those looking for even more performance, an M double-clutch transmission costs $2,900, while a set of carbon-ceramic stoppers will demand $8,150. An adaptive M suspension is $1,000, while two wheel options retail at $1,200 apiece. There are a number of other, smaller, less significant options (who buys rear window sunshades on an M3? ), but what you see here is the bulk of the optional goodies for both the M3 and M4. From the looks of it, ambitious buyers should have no issue building a M4 that crests the $90,000 figure. That’s a lot of money. It’s dangerously close to some serious metal, like the $98,000 Porsche 911 Carrera S, not to mention cars like the Jaguar F-Type R Coupe or Chevrolet Corvette Stingray Z51. What do you think? What’s your cutoff number for either of these cars, and what options could you not live without? Let us know in Comments.